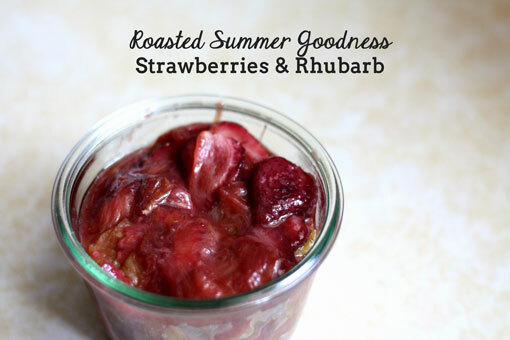 I don’t know about you, but when June rolls around I immediately start dreaming about strawberries and rhubarb. 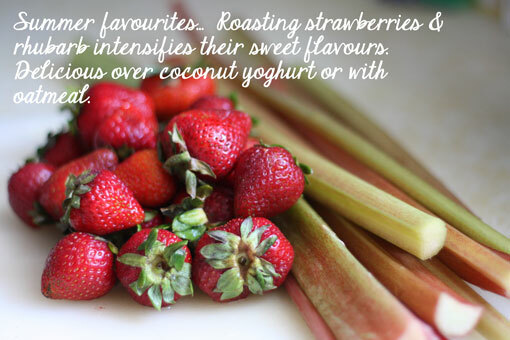 There is nothing more intoxicating to me than the sweetness of fresh strawberries combined with the tartness of rhubarb. Crisps, pies, and crumbles are all well and good, but the truth is, I really just want the filling. Straight up. On a spoon. In my mouth. You get the picture, right? So, in my mind, making a stewed compote just wasn’t going to cut it. I needed something with more depth and intensity, and the one thing all those desserts have in common is the fact that they are cooked in the oven, which changes the way the cooked fruit tastes. If I can cook strawberry and rhubarb in a pie or crisp, why can’t I just roast the fruit on its own, no shell of topping required? It turns out I can, and the results are delicious. My favourite way to eat this is on a spoon, straight out of the jar, but it’s equally delicious on coconut yoghurt with some homemade granola, or served up on top of your oatmeal. I bet it would also be divine on top of some coconut ice cream. Mmmm. If you’re connected with me on Facebook, Twitter or Instagram (@balancebodysoul), tell me (or show me!) how you would enjoy yours! Step 1 – Preheat oven to 400 degrees. 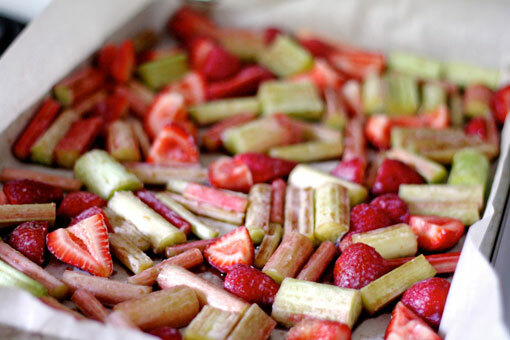 Chop rhubarb into 1” pieces. Cut strawberries in half, or if large, into quarters. Put chopped fruit into a large bowl. Step 2 – mix together melted coconut oil, balsamic vinegar, and maple syrup. Pour over fruit and gently mix until well coated. 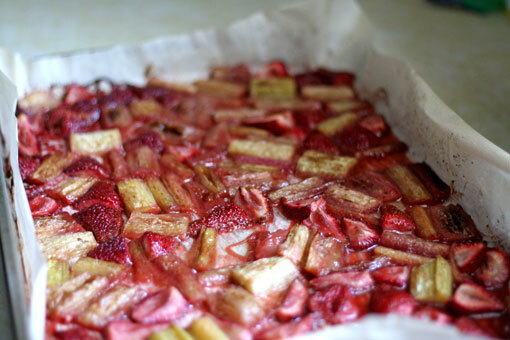 Step 3 – dump fruit onto a large baking sheet lined with parchment paper (if you don’t have parchment, use foil, but parchment will work best) and spread evenly, making sure everything is in a single layer. Step 4 – put in centre of oven and cook for approx. 40 minutes, or until fruit is soft, juices are running, and browning at the edge of the pan but not burning. 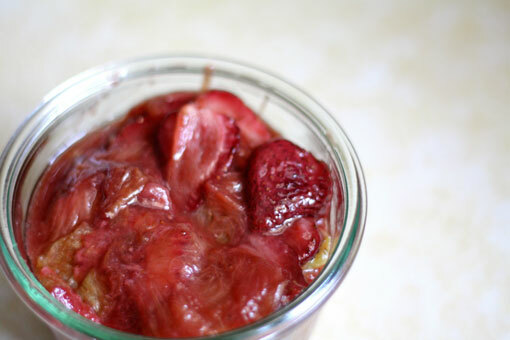 Let fruit cool for a few minutes, then scrape into a glass jar (or two) to store in the fridge, making sure to get all of the thick, runny juices scraped in there as well. The juices are where it’s at people. So good. Once cool, the coconut oil will harden again and you will see some white chunks, but don’t worry, just stir it all up and you won’t notice it at all. This concoction will keep in the fridge for about a week, if you can make it last that long.